There are farm tractors and then there are farm tractors. The classic Ford 8n that you see here is one of those. 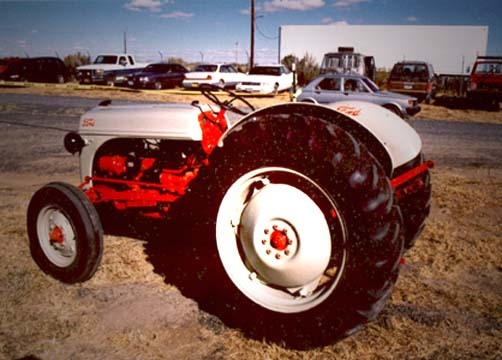 Objectively speaking, in the post World War II market, this tractor had a lot to offer. It was what we now call a utility tractor before its time. A lot of them were sold. The tractor was quick, light and featured a 3 point hitch. It was very popular with the 'weekend farmer' group. 'Real farmers' (what ever they are) often shunned the things, preferring instead the more traditional heavier and slower John Deere, McCormick, Case and Allis Chalmers machines. In my youth we derisively called the Ford a '2 plow downhill' tractor. The basis of the criticism was that although on paper, the tractor had plenty of power to pull 2-14" plows (using the classic formula of 10 HP to the plow), it often failed to do so under severe conditions because it was light and fast. By comparison the John Deere was made out of cast ion instead of Sheet metal and featured in the day a 2 cylinder engine with a very high torque rise. The weight provided the traction, and the torque rise assured that when the going got tough, it would just slow down and pop a bit louder, but in the end, would chug on through. Suffice it to say, the question of whether the Ford was the most innovative tractor of all time, or a piece of tin junk was sufficiently important to support many an argument. As usual, the facts were always more clear after several beers on Saturday night. Don't accuse this writer of owning this thing. I found this carefully restored model in Christmas Valley Oregon when it had been donated to a charity auction. I didn't buy it either, but did capture these pictures. What this tractor did do was to have a major impact on farming in general. People bought them for the 3 point hitch. Ford sold enough of them to bend the traditional manufacturers of farm equipment, IH, Deere, Case, Allis Chalmers, however. 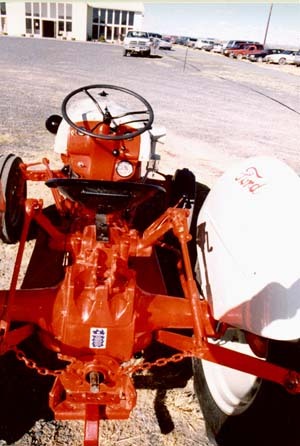 It wasn't long before all had a version of the 3 point hitch which revolutionized the design of farm equipment, which until then was either bolted on the tractor in some proprietary way, or towed behind on a drawbar.